Ventura, California.........One of the deepest "Turkey Night Grand Prix" fields in years brings with it one of the most talented rookie classes for the race as well. At press time, 23 of the 52 entries will be contenders for Don Basile "Rookie of the Race" honors for the 77th annual race on Thursday night, Nov. 23, including three drivers currently in the top-ten of the USAC National Midget point standings: Tyler Courtney (5th), Justin Grant (6th) and Tanner Carrick (9th). While Carrick is a true midget racing rookie and is the leader in the series' rookie standings, Courtney and Grant are veterans who just happen to be making their "Turkey Night" debut. 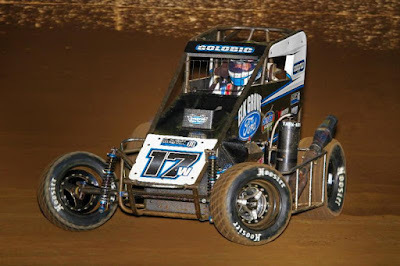 The Clauson/Marshall team brings along three race rookies in Ione, California's Grant, Indianapolis, Indiana's Courtney and Angola, Indiana's Zeb Wise, who made his USAC debut last Saturday night at Bakersfield (Calif.) Speedway, just days after celebrating his 15thbirthday. 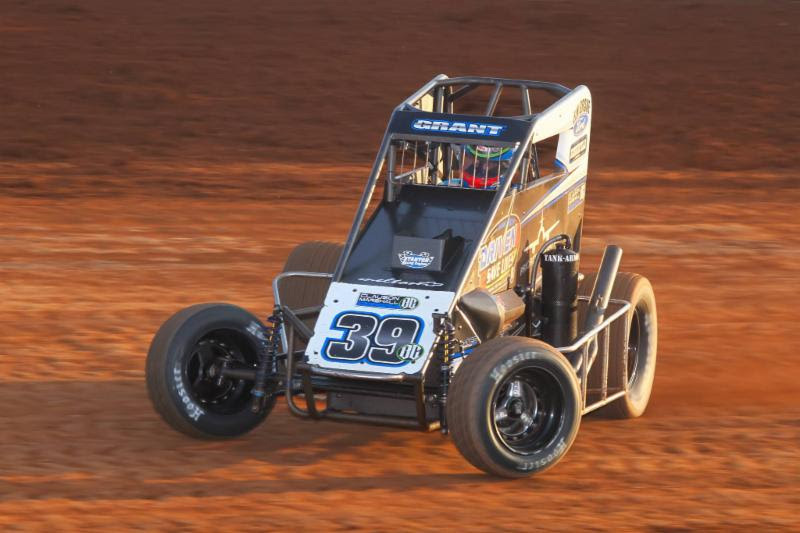 Grant and Courtney have teamed up for five total USAC National Midget victories this season with Grant, the 2007 BCRA Midget champ, taking the checkered in the season opener at the Southern Illinois Center in Du Quoin and a spectacular last lap, final corner pass to win at Pennsylvania's Susquehanna Speedway in August. 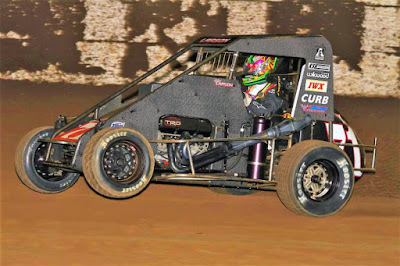 Meanwhile, Courtney, who got his start in USAC National racing in the seat of a midget, is one of five drivers to pick off three wins this season, which he did at Montpelier, Ind., Bloomington, Ind. and the Illinois State Fairgrounds Multi-Purpose Arena in Springfield. The top-rookie for USAC's National Midget division in 2017 is Lincoln, California's Carrick, one of seven pieces of the Keith Kunz/Curb-Agajanian powerhouse that has won the past three "Turkey Night" races in a row. Carrick leads all Rookies in top-tens (9), heat race wins (5) and feature starts (21) and is the lone Rookie to record a ProSource Fast Qualifying time this season in June at Lawrenceburg Speedway during "Indiana Midget Week." Mitchell, Indiana's Chase Briscoe already has a Rookie of the Year award under his belt in 2016 from a vastly different racing discipline - the NASCAR Camping World Truck Series. Fresh off his win in the trucks at the season finale in Homestead, Florida last Friday night, the sprint car racing veteran makes a return to his racing roots in a bid for his first career USAC National Midget feature start in a points-paying race. 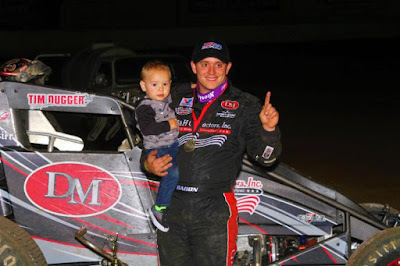 Additionally, he will be competing in the USAC West Coast/VRA Sprint Car portion of the program with hopes of capturing Automotive Racing Products' $50,000 bonus paid out to the driver who can win both the midget and sprint car feature on Thursday night. 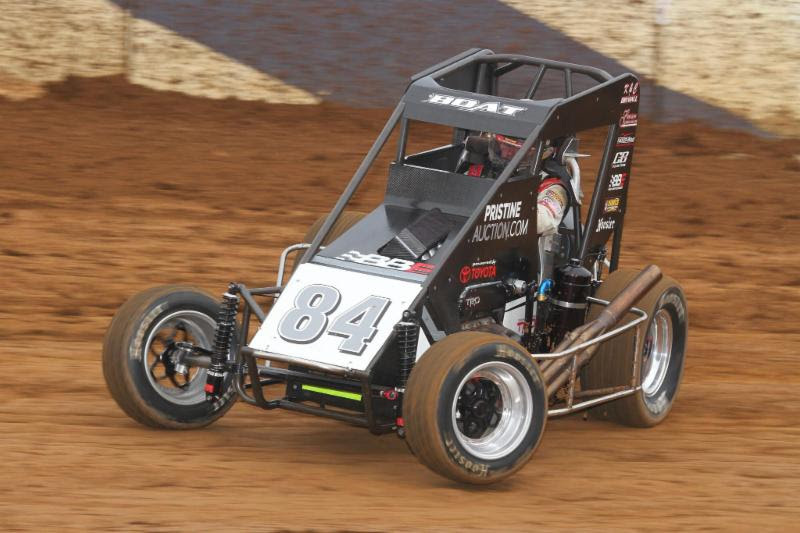 The National Midget division's second-leading Rookie, Brayton Lynch of Springfield, Illinois, has his grandfather and, famed crew chief, Rusty Kunz turning the wrenches on his first foray to Ventura. Also making the long tow to the beach are Tyler Nelson (Kansas City, Kansas), Daniel Robinson (Wayne City, Illinois), Mark Chisholm (Cheyenne, Wyoming), Tyler Edwards (Salina, Oklahoma), Rocky Mountain's Carson Garrett (Littleton, Colorado) and Mack DeMan (Mississauga, Ontario), one of two drivers arriving from outside of the United States. 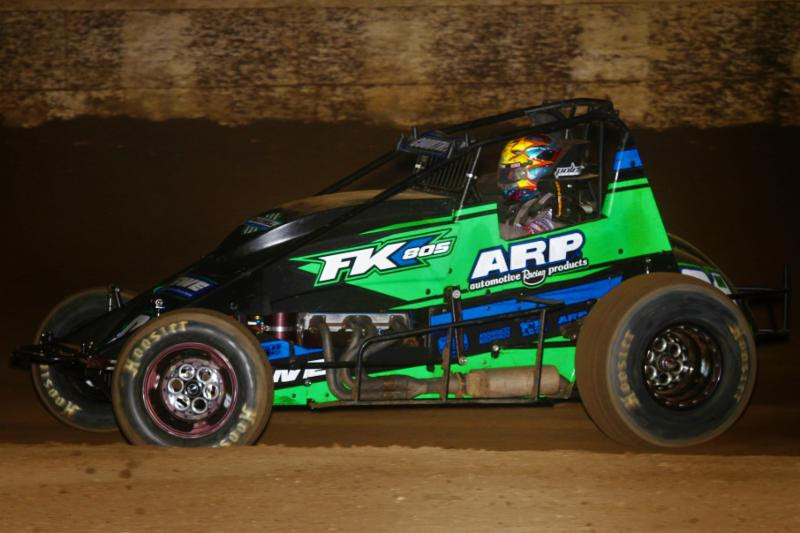 Sutter, California's Logan Seavey has already made his mark on the midget racing scene in his first season, capturing not only POWRi's Rookie of the Year award, but also the season championship with two victories while Mason Daniel of Visalia, Calif. is the USAC Light Up the World Beverages top Rookie in 2017. Additional "Turkey Night" Rookies from the west include Delano, California's Terry Nichols (14th in Western States points), Upland, California's Clayton Ruston (18th), Santa Monica, California's Kyle Beilman (24th), Lomita, California's Bryan Drollinger (26th), 2016 "Turkey Night" Sprint Car winner Geoff Ensign of Sebastopol, California (28th), Fremont, California's Dustin Golobic (36th) as well as Tony Everhart (El Cajon, California), Jake Vermeer (El Cajon, California) and Waddell, Arizona's Shon Deskins. This Rookie class will have a tough hill to climb with a star-studded field prepared to do battle on the one-fifth mile dirt oval in Ventura. Past "Turkey Night" winners Dave Darland (2007 & 2013), Kyle Larson (2012 & 2016), Christopher Bell (2014) and Tanner Thorson (2015) are entered, plus 2017 USAC National Midget winners Brady Bacon, Michael Pickens, series point leader Spencer Bayston and Chad Boat as well diverse racing standout Brad Sweet. Ventura, California.........The midget entry list for the 77th running of the "Turkey Night Grand Prix" continues to grow, currently sitting at 52 confirmed midget entries thus far for the Nov. 23rd race at Ventura Raceway. Two more race rookies, Carson Garrett of Colorado and Dustin Golobic of California have announced their intentions of competing in the famed race featuring the USAC National & Light Up the World Beverages Western States Midgets. Among the 52 entries, four past winners have signed up: Dave Darland (2007 & 2013), Kyle Larson (2012 & 2016), Christopher Bell (2014) and Tanner Thorson (2015) as well as 23 contenders for the Don Basile "Rookie of the Race," including Tyler Courtney, Justin Grant and Chase Briscoe. Watch both nights of "Turkey Night" LIVE on http://www.SpeedShiftTV.com/! ® represents a "Turkey Night Grand Prix" Rookie / Don Basile "Rookie of the Race" contender. Bakersfield, California.........With one of the busiest racing schedules of any driver in the United States, Brady Bacon annually competes in excess of 100 events a year on tracks from coast-to-coast. In Saturday night's "November Classic," it might've appeared the Broken Arrow, Oklahoma native had been an experienced master of Bakersfield Speedway. But, wouldn't you know it? Saturday night was the first time Bacon had even laid eyes on the track. Bacon, originally lining up seventh on the grid, worked the outside line to climb to the lead on lap seven. It was a lead he would never relinquish as he picked up his third USAC National Midget victory of the year in his FMR Racing/Brown & Miller Racing Solutions - Black Watch Farms/Beast/Toyota in the National series' first stop at Bakersfield in 17 years. "At the start, I was on the inside and I saw the outside got a pretty good run," Bacon observed. "The bottom was kind of glazed over from the moisture in the air or something. I knew it would eventually move back down there, but I figured I'd try to make the moves while I could. I went to the top and it worked out. We were the first ones in the front to do it and had a clear lane to the front." The beginning was tumultuous as Light Up the World Beverages USAC Western States Midget regular Michael Faccinto stepped out to the lead from the outside of the front row on the initial start. Meanwhile, pole sitter Michael Pickens slotted into second. While riding the high side in turn three, contact was made between he and Holly Shelton. As Pickens sat sideways in the middle of the track, he was slammed into by Shannon McQueen, who had nowhere to go. Frankie Guerrini and Dustin Golobic also became involved, but would restart along with Pickens. McQueen headed back to the hauler earlier than she had planned with a hurt racecar. The ensuing restart would only get back on track for a pair of laps before fifth-running Shelton got the back end loose in turn three. As she slid sideways, Zeb Wise, making his USAC debut, careened in while Ryan Robinson took evasive action to avoid the melee and climbed the outside wall before coming to a stop. Shelton's night was finished, but Wise and Robinson would restart. Once the race got back on the rails, Faccinto led the way on the bottom with series point leader Spencer Bayston just behind. Glancing behind Bayston, one could see Bacon running a slightly higher line than those he trailed, which took him to second around the outside of Bayston off turn two on the fourth lap. Bayston scrapped back, but Bacon had enough of a head of steam off turns two and four to clamp down on the top spot. As Bacon and Bayston tussled for the runner-up position, both simultaneously chipped away at Faccinto's lead. Quickly, it became a three-car race for the lead with the top-three appearing in Blue Angels formation exiting turn two. On lap seven, Bacon surged ahead of Faccinto midway down the back straightaway to secure the lead and instantly constructed a one-second gap over Faccinto and Bayston. With an open highway comfort cruise lying in front of him, Bacon was free to run his race as he pleased. "I ran the middle in (turns) one and two a lot," Bacon explained. "I diamonded three and four and came off as straight as I could. It was really heavy, so it was easy to get pointed in the wrong direction. I just thought it was going to be too far around the top and my car was pretty good on the bottom and in the middle, so I stuck with it. I started feeling a little less grip in one and two, but I moved around and pedaled it a little more." With Bacon pulling away, Bayston fought Faccinto for second throughout the next four laps until clearing him on lap 12. Bayston would receive a reprieve two laps later when new five-time USAC Western States Midget champion Ronnie Gardner slid sideways to a stop on the front straightaway to bring out the caution. With the substantial lead erased, Bacon would have to get back on the saddle once again. On the first try, Bacon stumbled and Bayston was able to hang in contention. Yet, when Cory Elliott slowed to bring out the yellow moments later, Bacon would get a reprieve and another shot at that restart. When that chance arrived on lap 14 restart version two, Bacon left Bayston on his own and instantly spurted away to a ten car-length lead that wouldn't get any closer despite Bacon having to fight through traffic in the final five laps. Bacon would race away to his sixth career series victory over two seconds ahead of Bayston, Tanner Thorson, Tyler Courtney and Justin Grant. In an odd circumstance, following the checkered flag, Courtney found himself on his side in Tommy Tipover fashion in turn two. He was uninjured. 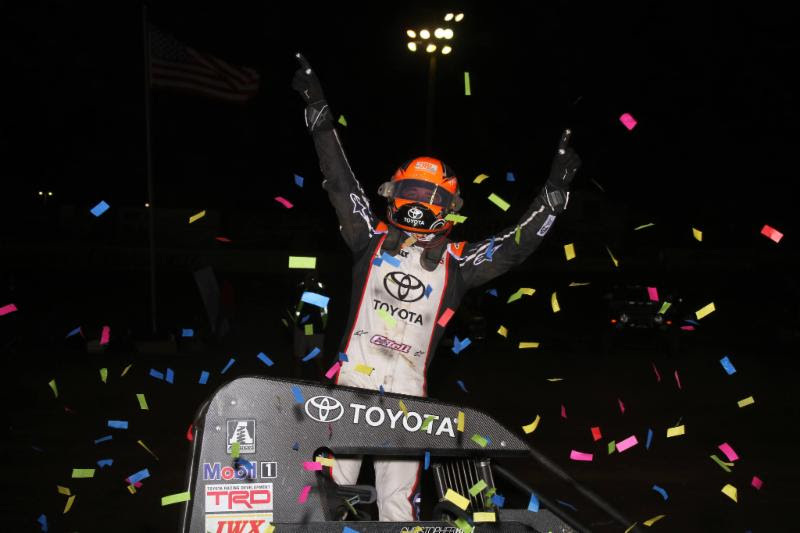 Despite finishing one spot behind Bacon at the finish line at Bakersfield, Bayston extended his USAC National Midget point lead by one to 67 in his Keith Kunz-Curb-Agajanian Motorsports/IWX - Curb Records - TRD/Bullet by Spike/Speedway Toyota. All the Lebanon, Indiana driver has left to do to clinch his first title is to simply sign-in at this Thursday's season-finale at Ventura (Calif.) Raceway's "Turkey Night Grand Prix." Bayston's teammate, Thorson, of Minden, Nevada set the tone by recording the ProSource/Woodland Auto Display Fast Qualifying time before going on to finish third in his Keith Kunz-Curb-Agajanian Motorsports/JBL Audio - TRD/Bullet by Spike/Speedway Toyota. 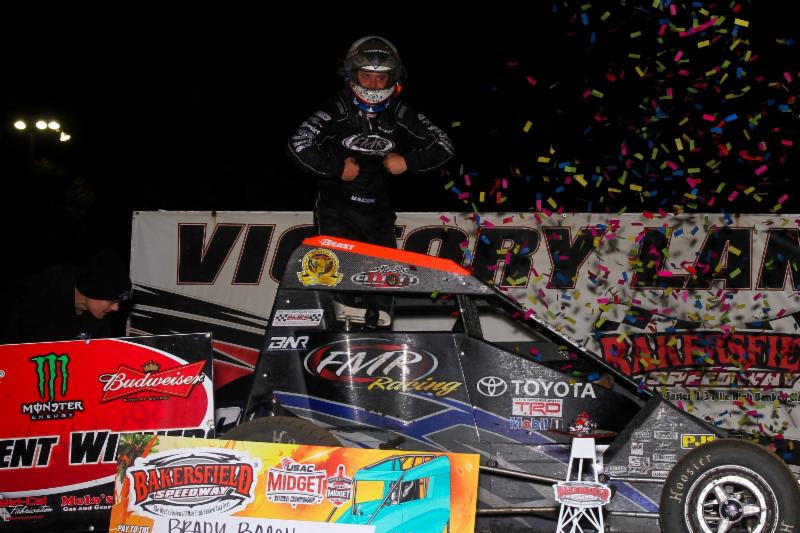 Two USAC National Midget track records were broken at Bakersfield. Jimmy Christian's 8-lap mark set in 2000 was surpassed by Shane Golobic in heat race two. The late Kevin Doty's 12-lap record from 1998 was passed by Brady Bacon during the semi-feature. Contingency award winners Saturday night at Bakersfield Speedway include Tanner Thorson (ProSource/Woodland Auto Display Fast Qualifier), Chad Boat (Simpson Race Products/Extreme Mufflers 1st Heat Winner), Shane Golobic (Competition Suspension, Inc./Brown & Miller Racing Solutions 2nd Heat Winner & KSE Racing Products/Esslinger Engineering Hard Charger), Zeb Wise (Chalk Stix/Keizer Aluminum Wheels/Saldana Racing Products 3rd Heat Winner), David Prickett (Indy Race Parts/Pyrotect Racing Cells 4th Heat Winner), Brady Bacon (Competition Suspension, Inc. Semi Winner) and Courtney Crone (Wilwood Brakes 13th Place Finisher). USAC NATIONAL & LIGHT UP THE WORLD BEVERAGES WESTERN STATES MIDGET RACE RESULTS: November 18, 2017 - Bakersfield Speedway - Bakersfield California - "November Classic"
**Courtney flipped after the checkered flag. 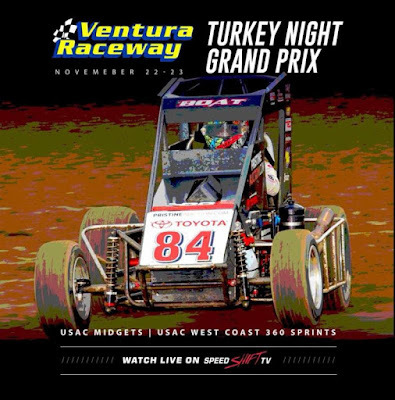 NEXT USAC NATIONAL & WESTERN STATES MIDGET RACE: November 23 - Ventura Raceway - Ventura, California - 77th "Turkey Night Grand Prix"